These Sweet + Spicy Coconut & Peanut Sauce Fried Rice Patties are gluten-free, vegan, and super flavorful, healthy and delicious. They make a great appetizer, snack or meal! These little patties are chock full of amazing flavor! Sweet, spicy, salty & savory goodness all in one crispy bite! I really had a lot of fun throwing these together. I was craving peanut sauce, but decided to kick it up a notch by adding coconut and a variety of spices until I had something with exciting depths of flavor -- and boy did these blow me away. Soooo good! And, the texture is very satisfying as well! 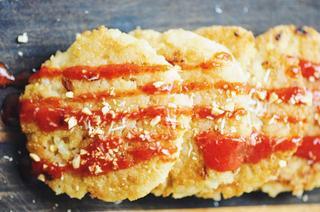 Crispy, toasty rice yumminess on the outside, and a sweet & spicy creamy coconut peanut center. Divine. Top it off with a favorite condiment, and you will be in food bliss in no time -- I promise! Make your Coconut Peanut Sauce by blending all sauce ingredients in a food processor or blender until smooth. Set aside.In a coconut oil greased skillet over medium-high heat, saute your chopped onion until beginning to brown.Add your Coconut Peanut sauce to skillet with onion and cook a few minutes while stirring.Add your cooked rice to skillet and stir until all is evenly mixed. Turn off heat and move mixture to a bowl to cool slightly.Liberally grease a skillet with coconut oil and turn to medium heat.Using ice cream scoop - sized dollops of your rice mixture, flatten into a patty with your hands and place into your greased skillet. Cook 4-5 minutes each side, or until desired golden crispiness. Repeat until you have 10 patties.Garnish your patties with crushed peanuts, shredded coconut, and a drizzle of Sriracha sauce (or any condiment of your liking) before serving.Enjoy!